College of Engineering brings future buildings to life. Check your everyday reality at the door of the U.A. Whitaker College of Engineering’s VIPER Laboratory and enter a world of virtual reality. In VIPER Lab, you can put on a pair of three-dimensional glasses and use a hand-interaction wand to move virtual furniture around a virtual room or virtual buildings around a virtual college campus. It’s virtual reality, and it’s a lot of fun, but it’s not a game. The lab’s acronymic name indicates that the College of Engineering is doing serious stuff with virtual reality: VIPER stands for Virtual Interactive Portal for Engineering Research. For those unfamiliar with the technology, virtual reality (or VR) is a computer-generated three-dimensional environment that a person can interact with and explore. A key word in VR is immersion, which is the perception of being physically present in a world that is simulated by software. To many people, virtual reality means games such as “Robo Recall,” “Need for Speed No Limits” or “Star Wars Battlefront: Rogue One X-Wing VR Mission,” but to the more serious-minded, virtual reality is a technology that’s becoming a powerful force in business environments, including engineering, architecture, education and medicine. One of VIPER Lab’s primary goals is to prepare students for this virtual reality business world. “Virtual reality is the future,” said lab manager Antuan Vazquez, who loves virtual reality games but doesn’t have time to play them. “We want students to be able to understand how this technology is being used by those at the cutting edge in the real world. We want them to be a step ahead so they’re not training when they get to the job site. Our students are developing 3-D models, learning the basics of how to create a virtual world. Among current student projects is a virtual-reality model of FGCU’s campus being created by software engineering majors. “The purpose of a 3-D model of the campus is, if the university wants to add a building, we can add it in 3-D to see how it looks,” said Vazquez, a graduate of Ida S. Baker High School in Cape Coral who also holds a bioengineering degree from FGCU. Software engineering students are also working on a math game called “Math Worm” aimed at fourth-graders. The game is based on the popular “Temple Run,” a 3-D “endless running” game in which the character, operated by the player, steals a golden idol from an Aztec temple and tries to escape while being chased by The Evil Demon Monkeys. This is a long way from the old arithmetic worksheets of the pre-VR days, just as VR engineering is a long way from drafting tables and T-squares. Students from the Department of Environmental and Civil Engineering who are interested in water management and flood control, for example, could create 3-D models of coastal communities to demonstrate how storm surges from different hurricane categories would affect them. “Then you could bring in policy makers and say, ‘Hey, here’s your city, and these buildings will be flooded if you don’t take this action,’” said Vazquez. “That would motivate policy makers to take action. Vazquez hopes VIPER, which became operational in February, will have impacts beyond FGCU. VIPER Lab is built around Corner Cave, a product of virtual reality innovator WorldViz (in VR-speak, CAVE is actually an acronym – often lower-case except for the “C” – for Cave Automatic Virtual Environment, and a Corner Cave is a cave that fits in the corner of a room). The Corner Cave consists of a series of projectors that project images onto walls, and a motion tracking system, a series of networked cameras that track the movements of users in real-time, so they can move within the 3-D environment. 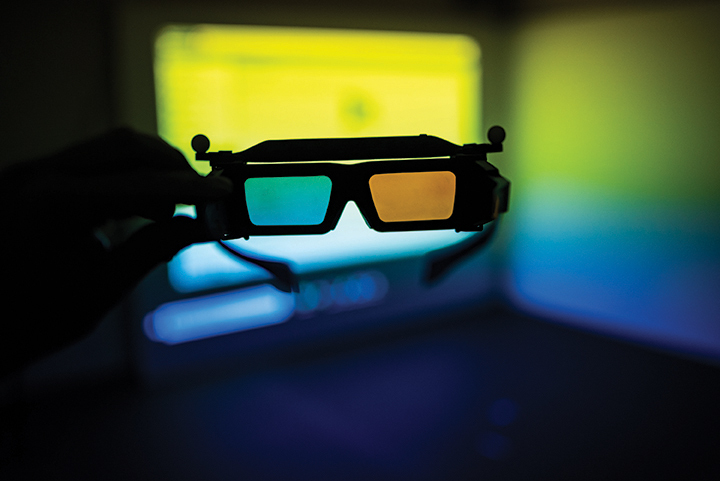 A virtual reality laboratory equipped with Dolby Atmos should be a big draw for potential engineering students, said Richard Behr, dean of the U.A. Whitaker School of Engineering. Behr said VIPER will have a major impact on the engineering college. “It has widespread applicability in all engineering disciplines,” he said. “It can be used to simulate construction sites; you walk through the site in a virtual environment, and you can mitigate problems on the site during real construction. But you can also apply VR to civil engineering and environmental engineering. In all, the set-up cost more than $200,000, a one-time allocation from the state in preparation for introducing a Construction Management program in the College of Engineering. Behr said that the construction management undergraduate degree program will commence at FGCU in fall 2019. Given the ongoing projects, future projects, and recruiting potential of the VIPER lab, Behr and Vazquez are obviously excited. But while the VIPER lab is up and running, and students are already involved with projects, there is still plenty of work to be done, Vazquez said. Putting a virtual reality lab together requires a lot of trial and error.